Australian university students give far more credit than the previous generation to the science of human evolution and far less to creationism or divine guidance, according to a landmark new study. In an overview of the last 32 years of annually-assessed student opinions, it is clear that belief among students that a god is the ultimate or contributing cause of human origins has steeply declined from being a majority view in 1986 to being a small minority view in 2017. Conversely, conviction that humans evolved without divine involvement of any kind rose steeply over the same period to become the dominant view among students. 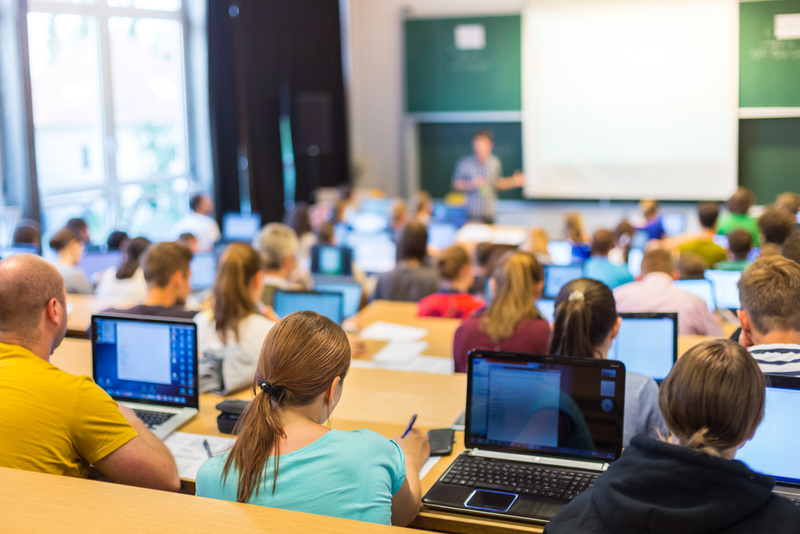 The findings – published today in Evolution: Education and Outreach – are the longest continuous annual survey of opinions about creationism versus evolution among first-year university students world-wide. Professor Michael Archer, lead study author and Professor at UNSW Science’s School of Biological, Earth & Environmental Sciences, says the original intent of the poll was to assess the level of commitment among incoming students to supernatural explanations for our origins. “Given that the creationist view (that humans were created by God within the last 10,000 years, rather than evolved naturally over millions of years without the involvement of God) is common among American students, we wanted to know how much of a challenge introducing the evidence for evolution to first-year students would be for us in Australia,” Archer said. From 1986 to 2017, every student attending the first-year biology course was invited to complete a one-item poll on a strictly anonymous basis. An average of 530 students a year participated in the survey. The results of the relevant year’s survey – and of all previous years – were always openly presented to the class in the following lecture. 3. People developed over millions of years from less advanced forms of life. God had no part in this process. 4. I honestly have no opinion about this matter. “First, the percentage of our Australian students endorsing the creationist option (the first one of the four) has been consistently small, averaging 10.4%, and slowly declining to less than 5%,” Professor Archer says. “Second, there has been a striking cross-over in the opinions of the successive cohorts of students. In 1986, 60% of the students endorsed either the creationist option or the theistic, god-guided evolution option (the second of the four above). By 2017, the proportion of students endorsing either of these theistic options had fallen to 28.8%. 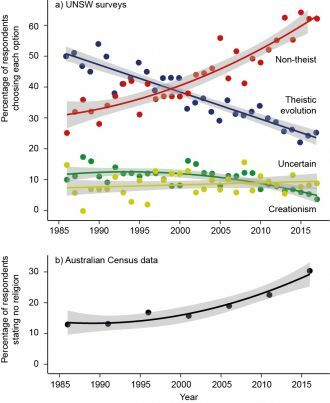 “In the USA, belief in creationism, while slowly declining, appears to have remained in the 40% range, four times that seen in our Australian survey,” Professor Archer says. The fact that commitment among Australian students to this view, the only one that involves refusal to accept evidence that humans have evolved from other animals, has always been low—and declining, suggested to Archer’s team that no extra effort was needed to communicate to first year students the scientific evidence for human evolution. The team has proposed additional strategies to better understand these long-term changes in student viewpoints. “There may be value in running a similar annual survey in some of the high schools that contribute to a majority of the incoming students to this university,” Archer says. The top figure shows the percentage of students who, between 1986 and 2017, choose one of four options in relation to the human evolution: (1) humans were created by God within the last 10,000 years (green); (2) humans evolved over millions of years with the whole process guided by God (blue); (3) humans evolved over millions of years but God had no part in this process (red); or (4) they are uncertain what they think (yellow). Figures include lines of best fit from linear and quadratic regressions with 95% confidence intervals. The bottom figure shows the percentage of the wider Australian public who have declared in national censuses between the years 1986 and 2016 that they have no religion.